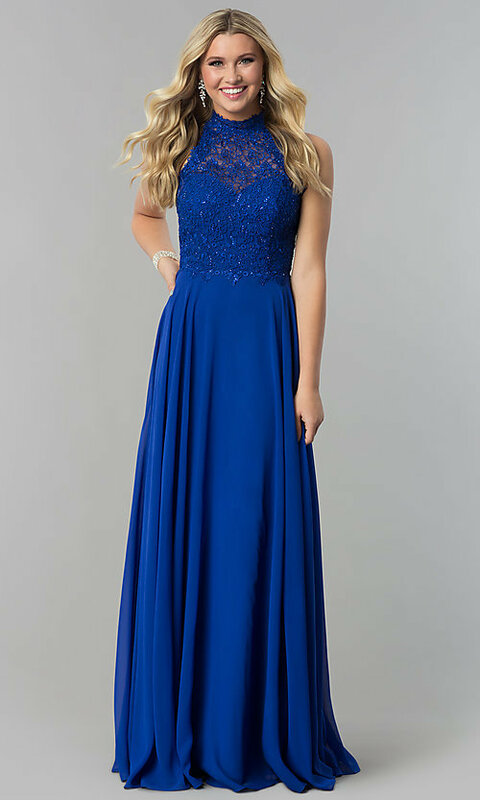 Here's a long prom dress, from the designers at Alyce, with beautiful embroidered lace and just the right amount of sparkle for your formal event. The elegant long evening dress features scattered rhinestones on the embroidered-lace bodice that allows the sweetheart lining to shine through. The high-neck collar wraps around and attaches to an embroidered racerback panel that tapers before fanning out in a starburst design that crosses the open back. Layers of soft chiffon flow away from the natural waistline to flatter the figure as it continues down to the floor. A thumbs-up style for winter formals or prom 2019, this long prom dress is sure to provide a striking entrance at your special celebration. The model wearing royal is 5'8" and wearing 4.5" heels.